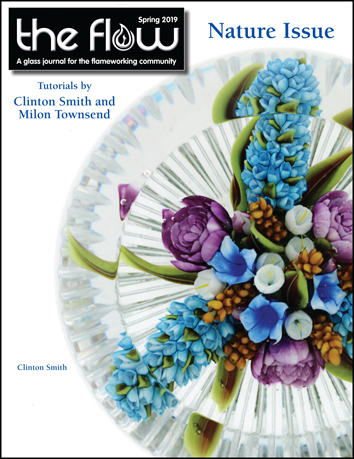 Contributing editor Clinton Smith shares techniques learned over his 20 years as a glass artist that lead to success. Having a unique product, being willing to adapt in the presence of changing markets, and sharing skills with others will give the glass industry the ability to survive and grow. The Flow Spring 2019 Nature Gallery features the work of 21 flameworking artists. Showcased is a collection of beautiful and innovative glass art that includes sculptural glass art, land and sea animals, florals, landscapes, a famous cartoon character, and home decor. On November 16, 2018, the New Jersey Council of County Colleges presented the first statewide Community College Distinguished Alumnus Award to renowned glass artist and teacher Paul J. Stankard, an alumnus of Salem Community College. Stankard was recognized for his unparalleled contributions to the field of glass art. Igor Balbi began his career as a glass artist with the serial production of simple objects before acquiring the skills that have led to collaborations with renowned artists Cesare Toffolo and Lucio Bubacco. Working with them and brothers Franco and Mauro Panizzi has resulted in learning new techniques and a growing knowledge of glass. The Natural Museum of Ireland—Natural History Museum owns over 560 models purchased from the catalog of father and son flameworking artists Leopold and Rudolph Blaschka. Their work creating lifelike sculptures of marine animals as educational tools have been perfectly preserved, a collection that continues to attract both artists and scientists. The Artists in Residence recipients for 2019 were recently announced by The Studio of The Corning Museum of Glass. Twelve artists from around the world will each spend one month at The Studio researching and experimenting with new techniques to further their work. Each resident will also present a public Lunchtime Lecture on their findings. As the glass art scene continues to evolve with social media taking over a large portion of the landscape in regard to marketing, it gives artists an opportunity to promote themselves. 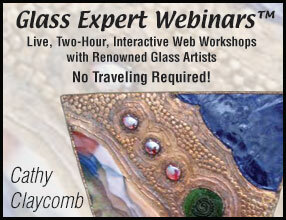 Artists who create custom work or commissions now have the chance to promote their work in a more intimate way. The Reader Reflections portion of The Flow offers readers a chance to share their thoughts on the articles found in the magazine. Pearls of wisdom are offered to help flameworkers navigate the fascinating world of glass art. Suggestions are offered regarding the importance of preheating glass in a kiln when making repairs, ways to fill gaps with new material, and dealing with cracks in glass art. Milon Townsend demonstrates creating a red-spotted toad sculpture using glass frits and powders to add detail to the toad’s body. Reference materials and photos are used to ensure authenticity for color, texture, body mass, shape, eyes, and toes. This helps to guarantee organic credibility and the creation of a believable sculpture. Clinton Smith uses soft glasses to create ripe strawberries with realistic yellow seeds, green leaves, and stems. The berries can be made in any desired size. 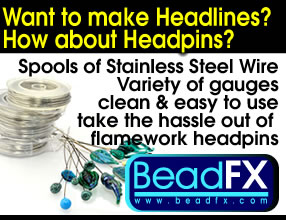 By adding a simple loop at the top, they can be used as a pendant or matching earrings. Joe Peter’s flameworked glass is highly recognizable, yet the artist has avoided predictability by pushing the boundaries and welcoming subjects as diverse as dragons, robots, and honeybees. Collectors delight at the release of new work, never knowing what subjects will be brought to life in his torch. Photography Courtesy of Paragon Industries, L.P.
Arnold Howard answers questions on digital controllers, including why they are sometimes inaccurate, the meaning of why temperatures rise in a stair step pattern, and whether solid-state relays improve temperature holds.